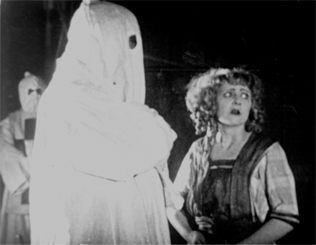 Big Stakes (1922), Productor: EU (Metropolitan), Franklyn E. Backer. 66 min. Entintada y con tonalidades. Director: Clifford S. Elfelt. Guión: Earl Wayland Bowman. Música: Donald Sosin. Intérpretes: J.B. Warner (Jim Gregory), Elinor Fair (Señorita Mercedes Aloyes), Les Bates (Bully Brand), Willie Mae Carson (Mary Moore), Hilliard Karr (Sidekick Skinny Fargo), R. Henry Grey (Capitan Montoya), Ethelbert Knott (Pascal). Las tonalidades de la película cambian de sepia a azul según el lugar donde se sucede la acción. Las escenas del lado americano son sepia y las del lado mexicano azul. La imagen estereotipada que tienen los norteamericanos de México se traduce en una atmósfera más española que mexicana y las mujeres traen mantilla y bailan flamenco con castañuelas. A diferencia de la mayoría de los filmes de la época que describen al mexicano de forma peyorativa, en este filme, es lo contrario. El capitán mexicano, quien usa un sombrero mexicano cuando anda de faena militar, resulta tener palabra y a al final ayuda al vaquero americano en el rescate de su novia rubia a manos del K.K.K., agrupación que en el filme se hace llamar “night riders”. La historia, bastante banal, rompe con varios estereotipos. La “sensual” y castiza Mercedes Aloyes, hija de un hacendado de herencia española y radicado en México, en Sonora para ser más exactos, escoge para desposarse al capitán mexicano en lugar del cowboy gringo. El malo de la película resulta ser el dueño del bar y miembro del K.K.K. Al final cada quien, el cowboy y el capitán, se quedan con las muchachas de sus respectivos países. Chasing a steer across the border a cowboy meets a señorita and stays on making the Mexican Captian jealous. When the Captain plans to have the cowboy killed, the cowboy gets the Captain to agree to a contest between jumping beans. When the cowboy wins he says he will let the senorita decide between the two. But first he rides off to rescue another girl held by the hooded Night Riders and the Captain follows to back him up. Mercedes Aloyez, the daughter of a wealthy Mexican rancher, is betrothed to Captain Montaya. 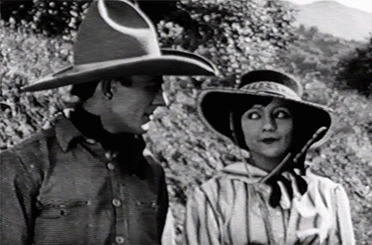 The rootin’ tootin’ buckaroo Jim Gregory (complete with comic sidekick) is in love with the ladies, but with a special eye towards barkeep Mary Moore. While out riding, Gregory saves Mercedes from a fate worse than death. (Well, actually, it is death.) The cowboy falls for the señorita, which earns the Mexican Captain’s displeasure. When Mercedes and Gregory meet for a nighttime rendezvous, they are captured by the Mexican soldiers. The Captain threatens them with the infamous and deadly Gila monster, but the resourceful cowboy bets his life against the captain’s with, of course, a race between Mexican jumping beans. A victorious (well, his bean, anyway) Gregory spares the honorable Captain and asks Mercedes to choose whom she loves. This uncomfortable situation is interrupted by the KKK (okay, actually the white-robed and a matching white hood-ensembled “Night Riders”) who has captured Mary. Gregory rides out to the rescue and upon return, discovers that Mercedes loves the Captain – and that he has a renewed fondness for Mary. Big Stakes is a fun and rip-roarin’ ride across the plains of western — and Western — cinema. And for 1922, a fascinating and complex look at Mexican and American stereotypes. A rarely seen independently made silent Western that’s set in contemporary times. It’s directed by Clifford S. Elfelt (“Under Fire”/”Danger”/”Flaming Hearts”) and written by Earl Wayland Bowman. The star is the 27-year-old James B. Warner, who would die two years later from TB. The film has a Latino beat and covers contemporary social issues such as racism, mixed marriages and feminism. It highlights fistfights, the KKK, the Mexican Army, Mexican songs, Mexican jumping beans, relationships between the Mexican aristocracy and working-class gringos, and a love triangle. Besides having a smart screenplay, it has some quirky dialogue that’s an acquired taste (one character laments “…dynamite is a tame sport compared to foolin’ around with women”). Mercedes Aloyez (Eleanor Fair), the daughter of a wealthy Mexican rancher, is betrothed to Mexican army Captain Montaya (Robert H. Grey). Though her father consented to the marriage, she is still not sure if she loves him and is not in a rush to wed. When American cowboy Jim Gregory (James B. Warner) crosses the Texas border to chase a stray steer on Mercedes’ property, they fall in love on the cute. While El Capitan is on army duty, he has the Yaqui goat-herder Pascal (A. Knott)watch Mercedes. When Pascal reports to El Capitan about Mercedes’s rendezvous with Jim, he gives the spy a present of jumping beans and returns with a squad to capture Jim and his overweight comic relief partner named Skinny (H.S. Karr). They end up wagering with El Capitan for the hand of Mercedes by betting on which jumping bean leaves the circle first. Also, the loser will have a poisonous Gila monster bite them. Jim wins, but allows El Capitan to live and Mercedes to choose the one she loves. Before they can deal with that, Jim receives word that his American waitress girlfriend Mary (Wilamae Carson ) needs his help because she has been captured by the KKK. It seems their hooded leader and her diner boss, Bully Brand (Les Bates), desires her and wants to eliminate his rival Jim in this trap he’s setting. The Mexican army helps rout the KKK so Jim can rescue Mary. In the end stability returns, as the senorita chooses her Mexican friend to marry and Jim returns to his independent minded modern working-class white woman, who drives a car. El filme presenta una actitud liberal del asunto racial en claro contraste con la obra de D.W. Griffiths A Birth of a Nation, 1915, y el climax pudo resultar en una velada crítica al filme épico de Griffith. La película esta llena de acción, romance, humor y varias otras características de los western: peleas en un bar, persecuciones a caballo, balaceras, etc.